Polish Homemade Soft Pretzels. © Barbara Rolek licensed to About.com, Inc. These Polish homemade yeast pretzels or precle domowe (PRREHTS-leh doh-MOH-veh) are crispy on the outside and tender-chewy on the inside. 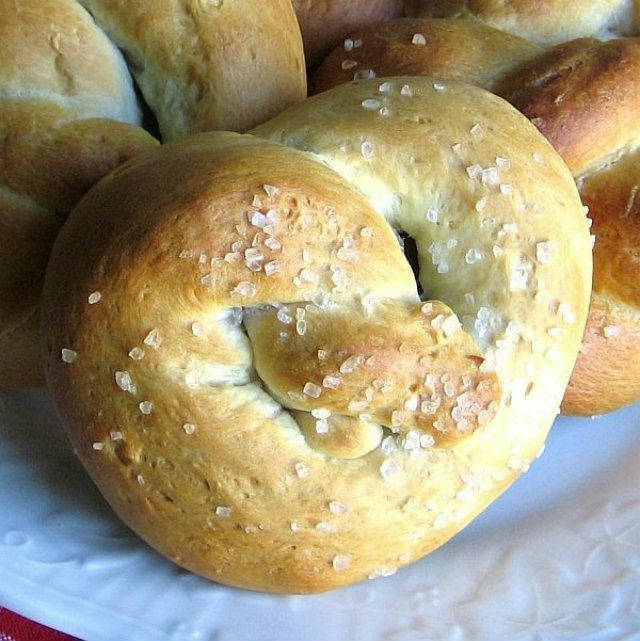 They're a little different from homemade German pretzels that use a lye bath before baking. But they are very good nonetheless. The baking soda-water solution in this recipe takes the place of the lye bath. If the pretzels are shaped compactly (so there are no large holes), they can be used as a very tasty sandwich roll. These pretzels are very similar to the ones you see being sold on the streets of New York City. Here is a larger photo of Polish Homemade Pretzels Recipe. In the bowl of an electric mixer, combine 1 1/2 cups warm water, 1 large tablespoon sugar, 2 teaspoons salt and 1 package (2 1/4 teaspoons) active dry yeast. Wait 5 minutes until the mixture becomes bubbly. Add 4 1/4 cups all-purpose flour and 5 tablespoons melted and slightly cooled butter. Mix at low speed with the dough hook attachment for 5 minutes, then increase speed to medium and knead another 5 minutes until dough is smooth and elastic, and cleans the sides of the bowl. Transfer to a greased bowl, cover with a cloth and let stand in a warm place to rise for 1 hour. Meanwhile, in a large saucepan or stockpot, bring the 10 cups water mixed with the 2/3 cup baking soda to a boil. Maintain a low boil. Divide the risen dough into 12 equal pieces. Roll each piece into a rope, about 24 inches long, and form into a pretzel shape. Heat oven to 375 degrees. Place parchment paper on a baking sheet and lightly coat the parchment with cooking spray. Dip as many pretzels as will fit comfortably in the saucepan or stockpot with the boiling water-baking soda solution and cook the pretzels for 30 seconds on each side. Transfer to the parchment paper-lined pan so the crossed ends of the pretzels face up. Repeat with remaining pretzels. Brush with beaten egg yolk-water mixture and sprinkle with coarse salt and/or sesame seeds. Bake 12 minutes or until golden. Remove from pan and cool on wire rack.